Opening of the Construction Railroad was a big deal, as it meant that supplies flowing to the building of Grand Coulee Dam could begin in earnest. 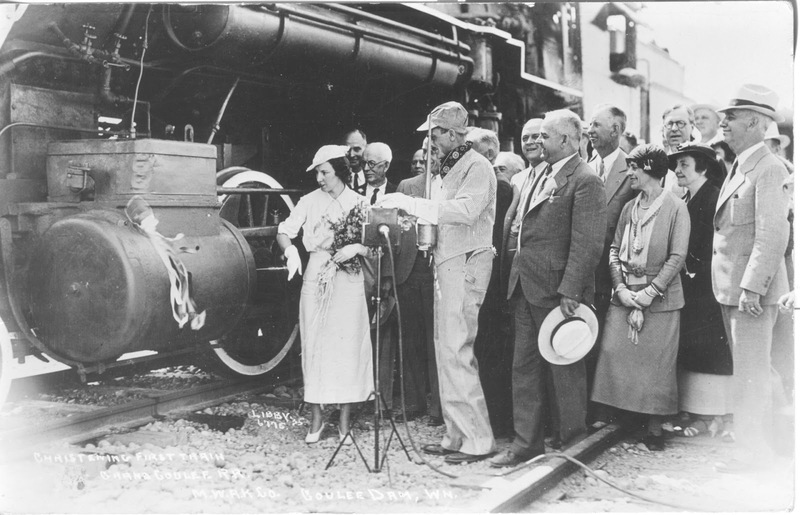 Part of the festivities of the opening of the railroad was Washington State Governor, Clarence Martin, of Cheney. He’s the one dressed up as the engineer. Miss Mary Cole with bottle of christening water; Rufus Woods the Publisher of the Wenatchee Daily World with his hat in his left hand; Mrs. Clarence Dill, Rosalie Gardiner Jones, standing to the right of Woods, whose husband pushed for the Dam in Congress; James O’ Sullivan, near the right with glasses, was a driving force to get the Dam built.